William Browder is trying to hold to account Russians who he claims are responsible for the death of his lawyer, and US officials have drawn up a blacklist of those said to have been involved in the case. This week, the BBC has learned, new names are expected to appear on the list. Browder got the phone call in the early morning of 17 November 2009. It was an unseasonably warm day in London, and he was still in bed. A colleague told him the news. Sergei Magnitsky, a lawyer who had uncovered what he said was a $230m (£140m) tax refund fraud in Moscow and was being held in a detention centre, was dead. Years later Browder still remembers how he felt when he heard. "It was like a knife in the heart," he said. Browder got out of bed and raced to the offices of his hedge fund company, Hermitage Capital, in the Golden Square area of London. He sent out a press statement pledging an independent investigation into Magnitsky's death. On that day and in the years that followed, Browder approached the case in the way he was trained at Stanford business school - methodically. He analysed documents and focused on the money. Browder pushed people in Washington to support a bill, the Magnitsky Act, that was signed into law in December 2012. It featured a list of 18 individuals, including three from Russia's interior ministry. Magnitsky's List, as it is known, includes people "who signed the documents", claimed Browder, that led to the lawyer's imprisonment and death. The US government will deny visas to these individuals, if they request one, as well as freeze assets in the US. Browder's pursuit of justice is both idealistic and single-minded. His critics say he has tried to shape US foreign policy for his own narrow goals and has lost sight of the bigger picture. According to a Nation article, he and other supporters of the Magnitsky Act seem "motivated more by their hostility to the government of Russian President Vladimir Putin rather than by any principled concern for democracy and human rights". Diplomats say that his efforts, however noble, are a sore spot in US-Russia relations. Things may become even more tense this week. State and treasury department officials are required to submit a report about the Magnitsky Act to Congress by 14 December. A senior Senate staffer who has close knowledge of the issue told the BBC that new names are expected to appear this week on Magnitsky's List. For Browder the bill is part of a larger plan. Even in the world of human rights, an arena that has more than its share of determined individuals, he stands out. "The idea of making money no longer drives me," he said recently, "but the idea of changing the world does." As he spoke, he was having breakfast in a Washington hotel. The sun, glinting off the Potomac River, filled the room. Browder, 49, has hazel eyes, and he looked tanned and fit. He describes himself as "this weird mix of human-rights activist and hedge-fund manager". He also has Dostoevskyean intensity. "The illness of Russian evil has plagued me," he said, describing how Magnitsky's death has affected him. "It's very personal," he said. "It wasn't like he was on a business trip and he died. He was selected to be tortured because he worked for me." When he talked about Putin, he slammed a spoon on a placemat on the table. Russian authorities have tried unsuccessfully to put him on Interpol's search list. He brushed off the dangers of taking on the Russian president. Media captionIn July, Browder told the BBC Magnitsky's conviction was "a truly historic and shameful moment for Russia"
"I'd rather die with a clean soul than live a life of compromise and fear," he said. He said that he wants to make sure law enforcement officials track every dollar that the Russians made off the alleged scam - and seize their assets, regardless of where the money is. "That way they don't get to keep it," he said. So far he has managed to ferret out $135m of the $230m that he believes was stolen. A senior state department official said names would be added - but could not confirm which individuals would appear on the list. Officials in Washington, as well as attorneys in New York, have been studying the Magnitsky Act over the past several months. It has also been cited in court documents. In September, for example, the US attorney in Manhattan, Preet Bharara, filed a civil forfeiture complaint against a real estate corporation, Prevezon, that owns property in New York. Bharara said individuals received money through the scam that Magnitsky claimed to have exposed. "While New York is a world financial capital," said Bharara, "it is not a safe haven for criminals seeking to hide their loot." Denis Katsyv is the owner of Prevezon, according to the court documents, and Aleksandr Litvak is his business partner. Timofei Krit is described as a director. "My companies and I do not stand accused by any law enforcement agency of engaging in any action to defraud the Russian Treasury," said Katsyv said in a statement provided by his American lawyer Mark Cymrot. "My companies and I do not stand accused by any law enforcement agency of being involved, directly or indirectly, in the death of Sergei Magnitsky." Efforts to reach Krit and Litvak through lawyers were not successful. Regardless of what the report on the Magnitsky Act says, one thing is clear. 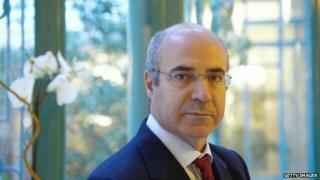 Over the past four years Browder has made an extraordinary investment in the promotion of human rights in Russia. His efforts raise the question - to what extent can one guy, armed with lots of fancy friends and a record as an investor, change the Russian way of doing business? "You should ask that question to Khodorkovsky," said Masha Gessen, a journalist and the author of The Man Without a Face: The Unlikely Rise of Vladimir Putin. She was referring to the former head of Yukos oil company, Mikhail Khodorkovsky, who has been held in a penal colony for more than a decade. As Gessen and other activists know, it takes more than money and street smarts to change things in Moscow. One needs luck - and to be in the right place at the right time. Browder was living in London when Russian officials began to crack down on his company. He is acutely aware of the fact that it was not he, but one of his lawyers, who paid the price for his efforts at institutional reform. He is a British citizen - he gave up his US passport years ago. He still dresses like an American, though, and sometimes talks like one. He wears loafers and loose-fitting jeans, not tight like a European. Over breakfast in Washington he spoke about the ability of officials to make rational decisions. He said he believed government officials would follow "simple logic" when putting together their report on the Magnitsky Act. It is a hopeful view. The real story of the bill, like most things in Washington, was hardly linear. To a certain extent the bill was passed because of his single-minded focus on the goal. The success also depended on politics and timing, and little of it was rational. At breakfast he poured milk over a bowl of homemade granola - but not much milk, just a drizzle. While he can sound like an American, he acts like an ascetic who is devoted to justice. It is a break from the stuff one hears in Washington, but also daunting. One is reminded that one's own life is ordinary, not to mention filled with compromises. He grew up on the south side of Chicago. His grandfather, Earl, was the general secretary of the American Communist Party from 1932-45. His father, Felix, was born in Moscow and later became chairman of the mathematics department at the University of Chicago. His father, who amassed a personal library of 35,000 books, hung out with Saul Bellow and other writers. Browder wanted to make money. "I was the black sheep of the family," he said. "I reacted to my communist family by becoming a capitalist." He graduated from Stanford in 1989, the year the Berlin wall came down, and moved to London. He began to put money into state industries being privatised in Poland. In 1996 he founded Hermitage with $25m and invested in Russia's national gas company. True to his populist roots, although in a hedge fund-manager kind of way, he worked hard to root out corruption. It was a good business plan, and within a decade Hermitage was worth $4.5bn. He was helped along by Magnitsky, a specialist in tax law at a firm called Firestone Duncan, and others in Moscow. "Most of the stuff he did was administrative stuff - mundane stuff," said Browder. "But that's what he was good at." In June 2007 Russian authorities raided the offices of Hermitage and Firestone Duncan. They loaded up vans with hard drives, corporate stamps and official charters and drove away. Magnitsky looked into the case and claimed that Russian officials had used the documents and seals in order to embezzle $230 million from the Russian treasury. "He was just doing his job," said Browder. Magnitsky testified before law enforcement authorities about what he had found. In turn Russian authorities claimed that Browder owed back taxes. They opened a criminal case against Magnitsky and other lawyers who worked for him. "I asked them to come to London at my expense," Browder said. Most accepted the offer. Yet Magnitsky, who was married and had two children, baulked. "He said, 'I have not broken any law,'" recalled Browder. Magnitsky believed that things in Russia had changed - and that Browder and others were too pessimistic. "You watch too many movies," he told a colleague in Moscow. "This isn't the 1930s." Not long afterwards Magnitsky was placed in a detention centre. He fell into a bureaucratic system that was like the Russian gulag, said Browder. "At breakfast we get porridge with insect larvae," Magnitsky said in one of his neatly-written complaints - there are 450 - that he filed with authorities. "At dinner - rotten boiled herring." "I have seen rats running along the corridors," he wrote. "At night you can hear them squeaking." Prison officials told Magnitsky that if he denounced Browder - and incriminated himself, he could leave. "Every time I reject these propositions by the investigators pushing me to commit such a base act, the conditions of my detention become worse," Magnitsky claimed. Browder said that he refused to cave. "No-one knows where a person's breaking point is, but Sergei was a man of steel," he said. Magnitsky began suffering from pancreatitis, a disorder that can be fatal. One afternoon in late August was particularly bad. "My cellmate… started pounding on the door crying for help," he claimed, "but no-one came." Magnitsky, 37, was taken to a detention hospital. When he arrived, officers put him in solitary confinement and handcuffed him to a bed. His wrists and knees were covered in purplish, reddish bruises. The brutality was hardly secret. An officer wrote in a report that he had "used a rubber truncheon" on him, according to a 17 November 2009 memo. Three officials signed the report. That evening doctors went to his cell, but they were forced to wait outside. When they entered his cell, he was dead. "A tragedy occurred," said Putin, attributing Magnitsky's death to heart failure. "There was nothing that would demand any criminal charges being brought." Investigators for the Russian presidential human rights council said he had been beaten - and was denied medical care. Browder began to talk to people in Washington. Yet many officials in the US, including those steeped in human rights and Russian affairs, resented his efforts. White House officials, especially then-deputy national security adviser Denis McDonough, who is now White House chief of staff, fought the bill, according to one former senior official who was involved in the negotiations over the bill. Administration officials said that is not what happened - or at least it is not the way they saw the situation. "We shared Congress' concerns on the Magnitsky issue and ultimately worked closely with the sponsors of the final bill to ensure it appropriately supplemented our current human rights legal framework," said Caitlin Hayden, a National Security Council spokeswoman. "We will use the tools in this legislation and other available legal authorities to ensure that persons responsible for the maltreatment and death of Mr Magnitsky are barred from traveling to the United States and doing business here." As Browder recalled, White House officials were unenthusiastic about the bill. "The administration said they did not want to upset the Russians during the reset," he said. "There were all sorts of objections." One of his critics was the US ambassador to Russia, Michael McFaul, a diplomat who does not always hide his views. Like Browder, McFaul studied at Stanford - and had written articles about Russia and human rights. McFaul was chosen as a "point person" for the administration's resistance to the bill "in part because of his reputation on human rights," said Paul Saunders, executive director of the Center for the National Interest. Inside the Senate visitor centre on Capitol Hill one morning in March 2012, McFaul looked annoyed. He was sitting towards the back of the room - he had arrived late - for a panel discussion that featured Browder. McFaul's frustration with Browder was palpable. "Just to be clear. Bill, we've taken action," McFaul said. "The people who are involved in the wrongful death are on a visa ban list. "The banking stuff is different," McFaul said, referring to the freezing of assets. "We do not support that." White House officials eventually decided it was not worth a fight, and the bill was signed into law. Putin was furious. Moscow officials passed a new law, banning Americans from adopting Russian children. Today many activists in the US say the law is overly ambitious, encompassing a visa ban and the freezing of assets. Treasury department officials are overworked, said one former official, and do not have time to take on all the cases. Charles Kupchan, a senior fellow at the Council on Foreign Relations, said that in some ways the bill was a mistake. "It ended up complicating relations with Russia," he said, "and fuelled those who think that the US is too interventionist." Others, however, believe Browder's campaign has worked. He is traveling around Europe this fall, reminding people about Magnitsky. Conservative MP Dominic Raab, according to the Independent, has been pushing for a British version of the law. If officials add new names to the list, a spotlight will once again be on Magnitsky. People in Moscow will be angry, but for those who support the bill that is the point. "You can't expect anything but backlash if you want to be effective," said Gessen, the Moscow journalist and author. "Backlash is what you want."